For the late Paul Virilio, speed was king in the modern world. The French sociologist contended that technology had outstripped the ability of politicians to legislate or to govern, such that democracy has now effectively been superseded by ‘dromocracy’ – the reign of speed. One only has to think of the new media that have arisen in the internet age, where information is communicated in ever more abbreviated and sensationalised forms, to share something of Virilio’s melancholy. The question is: how do we begin to restore to the broader public the time that is needed for extended, reflective thought – and with it, a democracy in which all members of society can take an informed stance? With the regular column on Scottish arts that Alan Riach has contributed to the The National since January 2016 – sometimes in collaboration with the painter Alexander Moffat, sometimes handing the reins to the composer and musicologist John Purser – the aim seems precisely to have been that of exerting a little pressure on the brakes of the media juggernaut. These essays offer a broad purview of Scotland’s literature, visual arts, and music, flitting from Dunbar to Duffy, from the ancient Celts to Joan Eardley. Cool and contemplative in tone, they seem to operate at a different pace to the majority of popular arts journalism, with its proclivity for ‘hot takes’. And yet, they have been published in a national daily newspaper. A readership of tens of thousands in Scotland has been exposed weekly, over the last three years, to serious, measured cultural criticism. The publication of Arts and the Nation is above all an opportunity to take stock – to assess just what sort of educational and political programme it is that is being advanced here. In the opening section of the book, on ‘Authors and Literary Contexts’, Riach begins by following Hugh MacDiarmid’s injunction – ‘Not Burns – back to Dunbar’. He offers a lucid, accessible summary of Dunbar’s key works, before continuing in a like manner to dwell on three further pre-modern writers: Duncan Ban Macintyre, Alasdair Mac Mhaighstir Alasdair, and Elizabeth Melville. He then proceeds to the twentieth century, with essays on the modernist surges that occurred in Montrose and St Andrews in the 1920s and 30s, and on MacDiarmid’s self-imposed exile on Whalsay. The choice of subjects here is telling. Taken together, they present a vision of Scottish culture that is polyglot, inclusive of women, that extends geographically far beyond the centres of Glasgow and Edinburgh into towns and regions that are often thought of as vestigial outliers, and that extends in time far back into the ancient past. Above all, this is socially motivated cultural criticism, designed to bring the peripheries back into focus. What’s more, it is pitched in an entirely popular register. If the strategy – the construction of a capacious Scottish cultural identity that celebrates plurality – is MacDiarmid’s, the language is emphatically not. One has the enjoyable impression while reading that Riach is warming to his task, sussing out what popular criticism ought to look like. The first essay, for instance, includes a slightly offhand comparison of Dunbar to Star Wars, but before long, the frame of reference deepens, and the reader is encouraged to make connections, for instance, between ‘Scott’s fiction, MacDiarmid’s poetry’ and the writing of Herman Melville. While remaining clear – never threatening to become verbose or academic – the prose matures, as the reader is increasingly trusted to take more daring inter-textual leaps. The collection proceeds from literature to the visual arts in Scotland, a selection of essays written by Riach in collaboration with Moffat, and then to John Purser’s section on Scotland’s music. Moffat’s hand can perhaps be discerned in some compelling readings of paintings, where material attributes – palette, line – become politically eloquent. Gillies’ large-scale watercolour landscapes, for instance, are said to depict ‘trees and forests as though they are symbols of a psychological state, a place of continual conversation, like endless running water or evolving clouds’ – they therefore ‘articulate a deeper urge to put Scotland on the canvas, tangible and exact’. Purser’s essays, meanwhile, include some real gems. Not least among these is the tale of Frederic Lamond, a weaver’s son from Lauriston whose prodigious talent for the piano led his family to somehow scrape together the funds to take him to Frankfurt. There, Lamond was taken under the wing of Hans von Bulow, and at length became one of Germany’s most respected musicians. This story follows hot on the heels of Purser’s defence of Sir Alexander Campbell Mackenzie, a maverick talent who once successfully fobbed his way through a piano exam he hadn’t prepared for, improvising a piece he later convinced the examiner was in fact a ‘Schubert Impromptu’. Purser is an extremely amiable writer – taken together, these two tales, told with great affection for the characters involved, present classical music as a force that can transcend class tribalism. They follow the example set by Riach, of promoting culture as a means at once of celebrating and levelling differences of identity. In the later stages of the book, these politics are set out more explicitly. One of Riach’s essays, in the section entitled ‘Scotland International’, presents a close analysis of a speech made by George Osborne in 2014, in which the then-chancellor insinuated that independence would make Scottish people ‘foreign’ to the rest of Britain. But foreignness, for Riach, ‘is not a threat or an imposition, but a matter of curiosity, of optimistic enquiry, of engagement and extension of the human spirit’. This applies both within Scotland – with the values of pluralism and the celebration of manifold national identities – and without. Riach introduces writers like Ed Dorn and Wole Soyinka, whose methods of speaking truth to power, whether in the US or Nigeria, he holds up as shining examples of civic-minded literature. Finally, the fight is taken to politicians and educationalists, who are deemed to have largely failed to enact a national programme of cultural learning with anything like the breadth that is offered here. In the concluding ‘Notes Towards a Manifesto for Uncertain Times’, Riach and Moffat argue that a proper education in the arts in Scotland is currently a luxury, when it ought to be – and in an independent Scotland very well could be – a democratic right. With the rise of the global far-right having continued apace since these essays were first published, how successful such values will prove in the years to come remains to be seen. For now, the principal achievement of this collection lies both in the sheer variety of voices it introduces, and in the model for popular cultural criticism – considered, reflective, serious, wide-ranging, yet accessible – that it advances. John Berger is invoked at length in the introduction, and indeed Berger’s example of the critic as someone whose primary function is to elucidate the social function of art, rather than simply to pronounce aesthetic judgments, animates these essays. Riach and his fellow authors are less concerned here with delineating a Scottish canon, with telling people what they ought to read, than with broadening it out – offering up the most diverse panoply of artists, writers, musicians and theorists they can, to alert readers to all that is out there, and to all they might have missed. On the few occasions when an unsympathetic critical judgement is passed, it seems to have been done so mainly so as to advance the cause of a more obscure artist. For instance, where Riach and Moffat pronounce Joan Eardley’s slum paintings to be too sentimental, they introduce another Glasgow painter, the Jewish-Austrian refugee Hilda Goldwag, whose stark modernist gaze allowed her to depict the working classes of the city with objectivity, and thus with dignity. The message here is clear: wherever shortcomings might be found, the cultural history of Scotland is capacious enough to make up for them elsewhere. The proper virtues of the arts, for these writers, are the ways that they reveal a world that is always ‘open, never with things fixed, finally formed and closed’. In this sense, they point the way toward ‘the best nation state’ – one in which ‘people [are] at ease with own plurality, and open to revision, able to choose for themselves’. The kind of serious, reflective thinking that the arts demand can still point the way towards true democracy. We just have to start making the time for it. 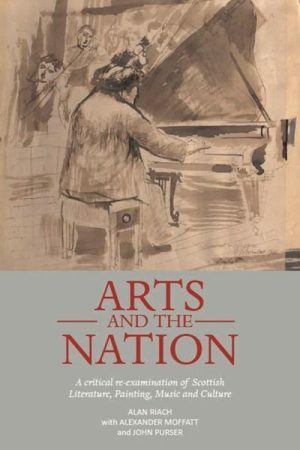 Arts and the Nation: A Critical Re-examination of Scottish Literature, Painting, Music and Culture, by Alan Riach with Alexander Moffat and John Purser, is published by Luath Press, 2017. Samuel Reilly is Editorial Assistant at Apollo magazine, based in London.